We are Amy, Bonnie, Carole, Dean, Maki, Mike, Natasha and Ricki. Please follow the links on the "about f&g" page to find out more about each of us and our art practices. We live, work, and play in Saskatoon and Area, Saskatchewan, Canada. The members of the Flock & Gather are serious about handmade indie crafts. We aim to bring together a community of makers, craft lovers, crafter newbies, professionals, and generally anyone who loves great handmade art. We host fun events such as craft nights, kids' markets, workshops and handmade markets. What we are likely most recognized for our annual handmade markets. We host these shows to present the public with a unique shopping experience in Saskatoon. Each juried market presents a changing list of amazing local and regional artists, and it's here that you can find all sorts of wonderful products, works of art, wearables and lovely things. We are committed to presenting a diverse selection of finely crafted handmade items that represent what the community has to offer. What’s the best way to contact us? You can also find us on facebook or on our blog, but email is the best way to get in touch. We also have a mailing list you can join to stay in the loop on events and calls for artists. Just send us an email with the subject “add me to your mailing list” and we’ll get it sorted. We organize the Winter Wonders Handmade Market on the first weekend in December at St. Joseph’s Parish Hall in Saskatoon. We also host the Itty Bitty Crafts in the City, a handmade market for young craft makers. Crafting get-togethers and workshops are occasionally hosted to continuously engage the craft community. This is our passion: to bring the community together and to support indie handmade. What are your markets like? Our markets have grown in leaps and bounds since our first sale in 2010. We rent a medium sized hall and fill it with about 40 vendors, including food and beverage vendors. The actual show runs Friday evening and all day Saturday. We use decorations, and music to provide a fun, inclusive feel at our events. Our latest markets have seen over 2500 of the most wonderful customers through the doors. What would I get as a vendor at one of your markets? *These funds cover our hall rental costs, advertising, and decorations. We try to keep the fee as low as possible to not limit who can apply. I want to be a vendor, what’s the application process? A few months before each sale we post a call for artists/vendors on our blog, our Facebook page, Instagram and via email to our mailing list. We require photos of your products and a completed registration form, including a brief bio, a website if applicable and some promotional info. It’s a simple, straightforward process. How does the jury process work and what type of arts/crafts/vendors are you looking for? We want the products at our markets to be truly handmade, not from purchased kits or patterns. Quality product photos are the best way highlight quality product. Is the artist doing something different than what we've seen before, or taking a craft in a new direction? We want to see what makes your work 'you' and give customers the chance to find items that they would not see anywhere else. 3. Where is the artist located? We are passionate about supporting local artists, but we also see a need to include artists from around the province and sometimes nationally. Why? Well we think it’s important to also showcase regional or national talent to build the Saskatoon craft scene in partnership with a community beyond its borders. 4. Is the artist emerging or established? We maintain a desire to include artists at all stages of their careers and have been proud of our commitment to exhibiting emerging artists (sometimes it has been their first show) beside artists who have been producing and selling for years. This means two things – that we provide opportunities for those starting out, and that we offer opportunities for informal education and mentorship between artisans. We all have something to learn from each other, no matter how long we’ve been doing what we do! 5. Has the artist been on one of our past sales? We like to include a mix of new and familiar artists at each sale. We don't give priority to vendors who have been a part of past sales - we do this to keep our sales feeling fresh and to allow a fair opportunity for new applicants. Being turned down for one sale doesn’t mean we don’t love ya, it just means that we are curating a different mix of artists this time. 6. How many other artists of the same discipline are in the show? Sometimes we have to make cuts to great artist because there are just too many applications in the same artistic genre. Jewelry is a perfect example. We can only accept so many jewelers before it becomes an all out jewelry show. We limit each discipline in order to lessen the competition within specific areas, and to hopefully enable greater success for those selling. I didn’t get in, what does that mean? Chances are it means you’re awesome. We sadly have to say no to so many great artists each time, as there just aren't enough spots for everyone. If you want some particular feedback drop us a line, but in general it’s just that there were more wonderful applications than spots available. Keep in mind that we try to change things up each sale, so please apply again in the future. 1. We find it difficult to jury vendors who make different products that fit into several categories. It may be beneficial to pick products from one category for market applications. Keep in mind that some categories may be more competitive than others. 2. The product photos submitted with vendor applications are the most useful tool we have for jurying. Therefore, quality photos will greatly strengthen an application. 3. We are always on the look out for unique products. Sometimes we receive two or more applications that contain nearly identical products. We realize that there are trends and that many makers may be inspired by other artists. However, these situations are difficult for several reasons. First, none of the applications are unique and fail to stand out during the jury process. Second, we recognize the possibility that one maker may have copied another but have no way of knowing who was making the items first. In these situations we may either select an applicant that we know was a “trend setter”, choose the applicant of higher quality (which is often difficult from photographs so we may choose an applicant whose work we’ve seen in person), or we may choose none of the “duplicate” applications. It can be frustrating to discover another maker whose work is very similar to your own but it also presents a challenge to find your own unique brand. 4. We have very limited space in the hall and we try to fit as many vendors in as possible. If you can, please consider applying for a 4’ space. We hope you find this information useful and we wish you all the best in your future endeavours. 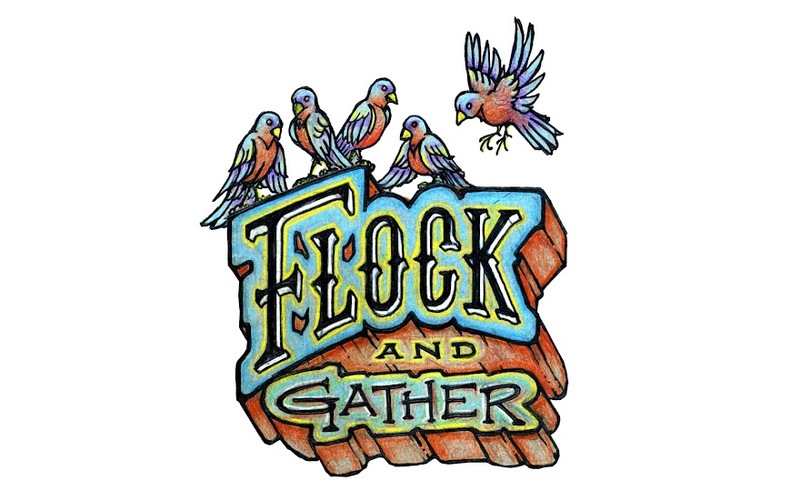 Can I be a member of Flock & Gather? Flock and Gather is a collective of 8 members who organize events. We don’t offer memberships because, well honestly, we’d have nothing to offer our members that isn’t offered to the community at large for free. But feel free to contact us about volunteer opportunities and ways to get involved. I’m not an artist but I’d still like to get involved. What other opportunities are there? Before and during our craft sales we are always looking for a few amazing men and women to help out with things such as putting up posters, event set up, picking up supplies, decorations, service during the event, and clean up after the events. Please drop us a line and get your name on our volunteer call list if you would be willing to help out. We appreciate any and all volunteer contributions.